Here we have the new mini release from Isomer, which takes the nosier aspects of the last album ‘Face Towards the Sun’ and consolidates it into a slightly more focused and forceful sound (…which I might add also deviates quite heavily from the dark ambient style of earlier albums). Essentially ‘Nil by Mouth’ seeks out heavy electronics / power electronics avenues – a la the sound of early Tesco Organisation and Loki Foundation labels, such as Dagda Mor, very early Inade, Genocide Organ, Ex.Order etc. With 6 tracks featured over 30 minutes, the sound bridges the clinical (computer generated perhaps? ), and a tone with a bit more grit and punch (analogue synth and distortion pedal derived perhaps?). Yet regardless of how sounds were generated, opener ‘Slave Ritual’ more than positive sets the tone – wavering noise layers, semi-militant looped percussion sample and an excellent vocals which are heavily distorted/ echoed in treatment. Within a similar focused frame ‘Regaining Our Faith’ presents a multi-faceted heavy electronics piece, built on multiple, downwardly spiralling noise layers, sustained drones and static crunch, complimented with echoed vocal sample. Wearing its influence on its sleeve and coming across as a solid homage to Genocide Organ ,‘When We Burn’ takes a layered approach to its wavering distorted core with occasional interjections of heavily processed vocals which suits the sound and approach perfectly. Final track ‘Infant Promise’ has some great random factory type clattered (recorded with some serious cavernous depth), heavy grinding bass textures and again with the heavily processed vocals, which all ramp up through the track’s duration before abruptly cutting out. Although released in a short pressing for availability at a live action Isomer played with Genocide Organ in Mannheim Germany in May, 2011, this should not be passed over as some sort of minor stop gap release. 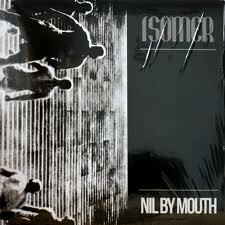 ‘Nil By Mouth’ illustrates a strong sound and focused direction for Isomer, and as such I am greatly looking forward to what comes next. This entry was posted in 2011, Cipher Productions, heavy electronics, power electronics by noisereceptor. Bookmark the permalink.